Progressive Industries 50 Amp Electrical Management System shuts power off for reverse polarity, power surges, open ground, open neutral, AC frequency deviations and accidental 220V, 2 minute 16 second A/C compressor delay, comes with 14’ of cable to connect the easy to read remote display. Being an RVer and traveling all around the country gives you such freedom and variety, but sometimes visiting new parks means that shore power might be compromised. Every RVer needs power protection to keep their RV appliances and wiring safe from unexpected power problems and costly repairs. Portable surge protectors are great, but sometimes we forget to pull them out of the baggage compartment to use them. During usage they are also left outside and are susceptible to theft. The Progressive Industries 50 Amp Permanent Electrical Management System is permanently installed in your coach so it is always watching out for you and it is kept safe behind locked doors. When Progressive Systems says they are monitoring, they really are – 24 hours a day. The response rate is lightning fast at 1 billionth of a second! Progressive Industries Electrical Management System is not just a surge guard, it is a management system that gives you Multi-Modes of surge protection, L-N, L-N, L-G, L-L, and N-G, with a joule rating of 3580, and an 88,000A surge current. Repairing broken electrical components can really be a pain, but Progressive Industries 50 Amp Permanent Electrical Management System has a modular design with plug and play parts that makes repairs simple. The Progressive Industries 50 Amp Permanent Electrical Management System has a state-of-the-art Computer and microprocessor programmed with software that constantly assesses for all the power problems you could imagine. The EMS turns off power in any of these situations, accidental 220V, open ground, reverse polarity, open neutral, or AC frequency deviations. The Progressive Industries 50 Amp Permanent Electrical Management System is also watching out for high and low voltage spikes and instantly shuts down power if there is a drop below 104 volts or a rise above 132 volts. Progressive Industries features a Lifetime Warranty to the original owner. Progressive Industries guarantees that their product will be free from defects for a lifetime. That is a warranty that its competitors currently do not offer. If you are shopping around for a surge protector you will usually see a section about restart delays that are around 2 minutes 16 seconds. A/C compressors need time to wind down before restarting power. The Progressive Industries 50 Amp Permanent Electrical Management System creates a 2 minute 16 second delay when restarting the power, to protect your A/C compressor. You will know when power has been turned off because the reset indicator light will flash for 2 minutes 16 seconds then power will be restored. Progressive has made this 50 Amp EMS, with a built in bypass switch letting you override the system and turn power back on if needed. The surge protector aspect of the EMS stays active even if you bypass the system. The monitor on the Progressive Industries 50 Amp EMS comes with a 14’ cord that snuggly attaches to the port on the EMS. The display is continuously showing power information displaying each message for two seconds at a time. You will see voltage, frequency, error codes, previous errors and current readouts. Error codes are conveniently stamped on the unit. How easy is that! If you are storing your RV regularly the permanently installed 50 Amp EMS will be standing guard when you plug your coach in to shore power to recharge your batteries. If you are parking at home or at a storage facility the Progressive Industries 50 Amp Permanent Electrical Management System is protecting your coach from all those electrical issues that could be lying in wait to strike your RV. One great thing about stopping at Dyers is that we try to find the most information we can to educate our clients about parts RVers need and want. When you are browsing our website take a look at the useful downloads section where we put Owners manuals, troubleshooting guides and any other useful information we find about the products we carry. *** When you are shipped this Progressive Industry Hardwired Surge Guard the remote and cable are packaged inside the unit as a safety precaution during shipment. Once you receive your system unscrew the cover and you will find the remote and 14’ cord. Very good product and super fast shipping. Great surge protector at a great price. Fast delivery from Dyers! Protected RV on first trip out. Well worth it! Although I have not experienced and park-power problems (yet), I rest easier knowing a quality unit such as this is monitoring my unit. Installation was without any big problems, although where I installed the unit in my Jayco Seneca wasn't the easiest area to work. I did install receptacles and plugs on the wiring in the (unlikely) event I ever need to completely bypass the unit. I installed the first display near my power cord reel, but also have a second display that I want to place inside the unit when I have time. Too bad both displays cannot work simultaneously, I can see forgetting to switch it to the interior display after hooking up and having to put on my bunny slippers and go back outside! I also wish the data connection was on the back of the display for a cleaner install on my control panel inside the coach. Dyer's was great, good price for the unit and very fast delivery. through. 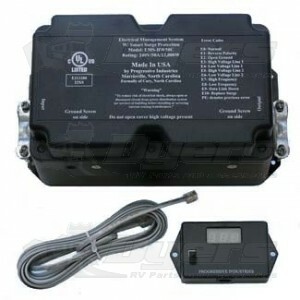 Every RV should be equipped with one if using Park Power. Don't let a park say there is something wrong with your EMS System, because there is not. The problem is with the Park hookups. This system will save you Thou$ands of dollars in the long run. PHENOMENAL and resting easy in lightning storms! Best purchase decision I have made for my motor coach.